The state Department of Ecology previously declared that Washington's approximately $113 million share of the Volkswagen settlement funds would be put toward zero-emissions vehicles, vessels and infrastructure. OLYMPIA — Washington and 16 other states intend to spend a total of $1.4 billion from the Volkswagen diesel-vehicle settlement on boosting zero-emission vehicles to fight climate change. The money is part of a pledge by the 17-state coalition known as the United States Climate Alliance to use the money to reduce transportation emissions. 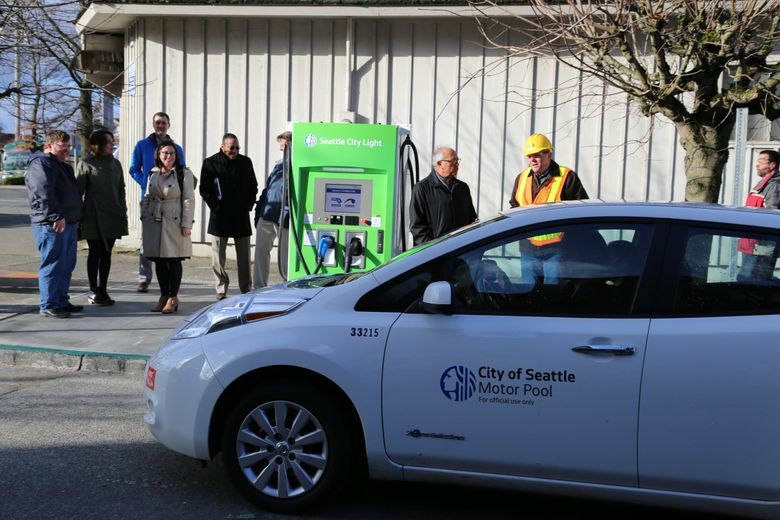 The state Department of Ecology previously declared that Washington’s approximately $113 million share of settlement funds would be put toward zero-emissions vehicles, vessels and infrastructure. Some of the money would go to electrifying part of Washington’s ferry fleet. But all 17 states in the Climate Alliance have agreed to prioritize electrifying vehicle fleets, Inslee said Friday in a conference call from San Francisco. Inslee is there this week for the Global Climate Action Summit spearheaded by California Gov. Jerry Brown. Because much of Washington’s power already comes from clean-energy sources, transportation emissions are “where our big bugaboo is,” said Inslee. Inslee declined to give details about how all of Washington’s money would be spent. But he talked about the need to purchase more electric vehicles for the state, and build more charging stations at state-owned buildings. Beginning next year, 50 percent of new vehicles bought by the state would be electric, said Inslee. It’s tough to get to 100 percent right now, he said, because the state still needs trucks and heavy vehicles that can go off-road. The settlement money comes from a $14.7 billion agreement between Volkswagen and the U.S. Environmental Protection Agency and California for violations of the U.S. Clean Air Act. The company had admitted using unlawful software on some of its diesel vehicles to get around emissions tests. About 24,000 of those vehicles had been registered in Washington. According to the state Department of Ecology, the money could fund electric-vehicle-charging stations, or replace diesel engines in public vehicles, buses and vessels with either cleaner diesel engines or electric engines. Or it could be used for other projects to cut diesel emissions. In 2007, the Washington Legislature required that public agencies move toward electric-vehicle fleets as much as possible. A survey released earlier this year, however, found many have fallen short of that goal. At the summit, Inslee also signed an agreement between Washington and the United Kingdom to work together to speed up the shift to low-emission vehicles and clean-energy public transportation.